Thank goodness for my foodie friends, otherwise I would probably have never stopped into Isla Pilipina in Lincoln Square. 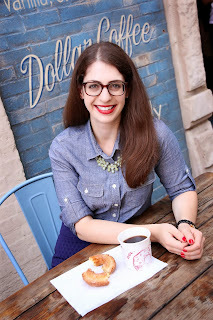 Marly and Mark from my Chicago Foodies family recommended it and even wrote a blog post about it several months ago. The small, family-owned Filipino restaurant serves some of the most delicious food I've had in awhile. The BYOB restaurant is located in an unassuming strip mall on Lawrence Ave. which conveniently also houses a liquor store next door. Talk about fate. While reservations are encouraged since the restaurant is on the smaller side, the BF and I stopped by around 6pm on a Friday night and were able to grab one of two remaining tables where we plopped down our six pack of Revolution Brewing's Fist City. The ambiance is nothing special, but you'll be so distracted by the delicious flavors and smells of your food, you won't care. This is a no frills family spot where you can tell there are a lot of repeat customers. I asked several friends for recommendations on what to try before we visited Isla Filipina. There were way too many suggestions meaning two things: 1) I will have to go back with a larger group to try more dishes, and 2) nearly everything is delicious. There are a few egg roll options on the appetizer portion of the menu and we tried the vegetarian version with tofu, lettuce, jicama, carrot, and green beans. 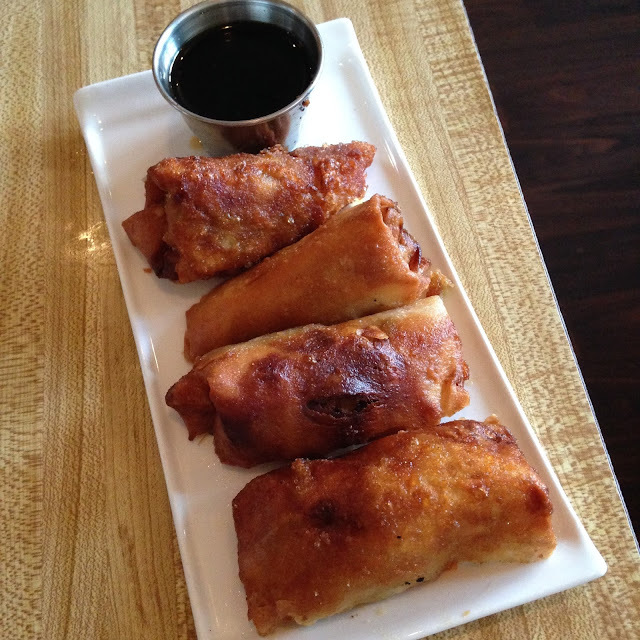 They were a delicious version of your standard egg roll, but as soon as I saw the table next to us order the Lumpia Shanghai, or mini egg rolls, I had instant regret. Next time I'm ordering those, filled with pork, egg, jicama, green onion, carrots, soy sauce, and love, Yes, love is on the menu. These are served as a 10 piece or 20 piece order. This made me think of them as a much better version of a Filipino chicken McNugget. For being such a small restaurant, Isla Pilipina's menu is pretty large. There are appetizers, soup, noodles, veggie dishes, seafood, and house specialties. We decided the split one of those specialties, the adobo chicken. You can also order this dish with a mix of pork and chicken. The adobo chicken featured chunks of chicken marinated in a sauce of garlic, vinegar and black peppercorn. It was amazing! The chicken was so tender we didn't even have to use a knife, and the sauce was so flavorful and delicious on top of our side of rice. All entrees are served with rice but I was told I had to try a side of garlic rice. This resulted in a massive overload of rice but it was well worth it. 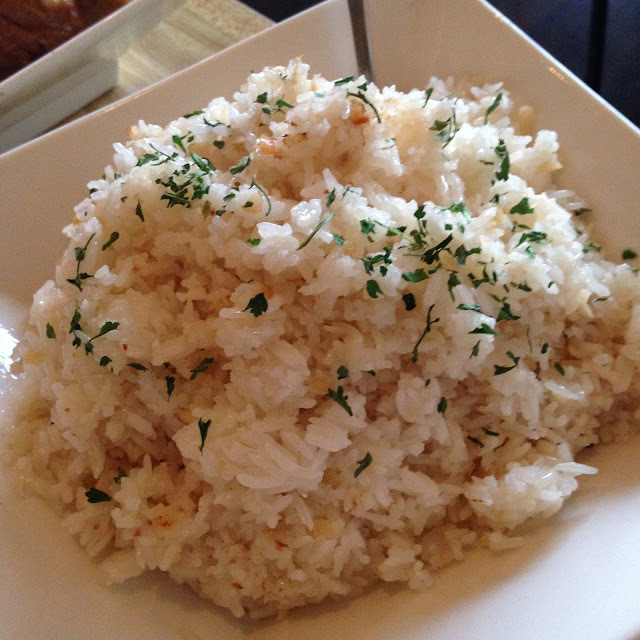 The garlic rice is so simple, yet so amazing. If you're a garlic lover, you will be in heaven. They take standard jasmine rice and pan fry it with garlic. That's it. But trust me, you'll want an order. And yes, you will smell like garlic all night. Worth it. The second entree we split was also incredible and boggles my mind. The whole red snapper served in a sweet and sour sauce is only $15! And it comes topped with a generous portion of fresh, crispy veggies. If you don't mind your food looking back at you, I'd highly recommend ordering this. 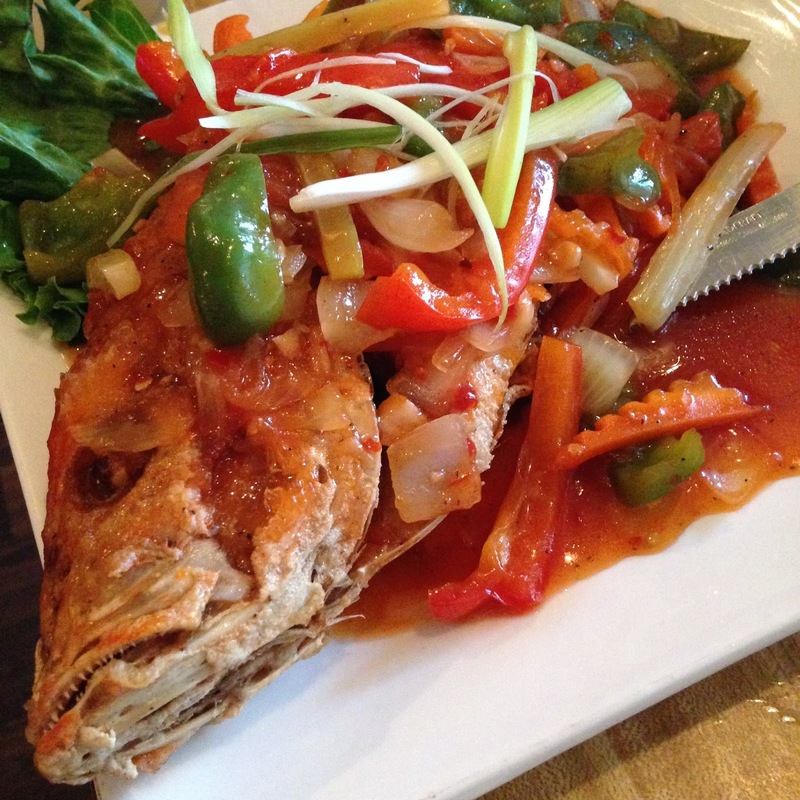 The snapper is crispy on the outside, and incredibly tender and flaky in the middle. Between two people we could not finish it so it's a great dish for sharing with a larger group. While we skipped dessert, many people were ordering the halo-halo, a mix of crushed ice mixed with fruit and bean preserves, and topped with ice cream and leche flan. I'll have to try that next time...along with the other popular menu items I didn't have enough stomach space for. I'd recommend stopping in with a small group so you can try several dishes off the menu. Everything we had was so flavorful and cost us less than $20 per person. There's no corkage fee and with a liquor store next door, it can't get any easier. Just make sure to make a reservation in advance! I'm giving Isla Filipina 4.5 ghosts out of 5 for its flavorful dishes, friendly waitstaff, and overall value!